Since believing in superstitions and magic was a characteristic feature of premodern societies, it is no wonder that these ‘doctrines’ could influence those fields of the sciences that were based on observation, experimental investigation, and theoretical explanation. Middle Turkic medical writings also reflect a fluctuating mixture of the rational and the irrational. In my paper I try to present one of the most extreme manifestations of the irrational – the belief in the existence of all-curing medicaments. These various panaceas and other miraculous cures will be categorized, analyzed, and demonstrated through examples from Middle Turkic medical texts. The classical definition of shamanism is based on the Siberian example, which excludes the use of writing. For this reason shamanism is usually associated with orality. Contrary to such a generally held view, we find a certain form of shamanism in southwestern China which is based on a secret and exclusively ritual writing. Ensuring a link between the human world and that of the spirits, this writing, which is also a vital substance, is effective if chanted and accompanied by blood sacrifices. Since the 19th century, this ‘literate shamanism’ has had some contact with the Catholic religion. More recently, the central authorities have used the ritual writing to wield power over shamans and their ethnic group. The interaction between this writing-oriented belief system, a religion based on a sacred book (Catholic Christianity), and the State tends to generate new forms of shamanism. The Evenki of Siberia are modern hunters who live in the extreme environments of the taiga. Their social organization has traits of egalitarianism which present a living alternative to the Western form of social organization based on hierarchical structures. This egalitarian social organization maintains its coherence through other mechanisms, which exclude planning, direct management, and authoritarian orders. Our project deals with one particular aspect of the practical implementation of egalitarianism – how the egalitarian principles of Evenki social organization are expressed in their behavior and forms of interaction. The Evenki’s activities are coordinated not through strict rules, orders, or other verbal forms of communication, but through skills and the experiences of collaborative enactments. The project is devoted to the study of Evenki everyday life, with a special focus on the role of nonverbal information in social interaction, and is based on photographic and videofilm analysis. This article is based on the materials collected by ethnologist Vilmos Diószegi on a field trip in August, 1958. It was the first time that a Hungarian ethnologist had conducted fieldwork in Siberia during Soviet times. Diószegi had made three short field trips to the Western Buriat (Bulagat), Khakas, and Tofa minorities before he reached Tuva. He visited the Tozhu District in northeastern Tuva alone, because Anton K. Kalzan, a local folklorist who transcribed his material, was unable to join him. In Tozhu, Diószegi met Ekaterina K. Mïndïrmaa, who later became his helper and interpreter. Diószegi met only one shaman in Tozhu, Ak-Nïtka, who refused to talk to him, so he was able to collect shamanic songs only from informants who were not shamans. These songs contain important information about the initiation of the drum (dünggür ööredir), invocation of the spirits through songs, spirits of nature (ee) and their idols (eeren), and the sacred trees (ïdïk and xam ïyaš), as well as about ancestor spirits (dös) and the shaman’s staff (dayak). Diószegi published only a short article on this field trip and a few lines from the shamanic songs he collected. The present article is a short introduction to this valuable material, which is now kept in the archives of the Institute of Ethnology, Hungarian Academy of Sciences. It is well-known that the sinicization of the Manchu caused the loss of their mother-tongue and writing ability. When Manchu texts had to be preserved, their pronunciation was recorded using Chinese characters. The reconstruction of such texts is sometimes difficult, but it offers a rich field for the study of Manchu shamanism and its prayers. The paper examines some basic terms in early Hungarian healing that are connected with magic and religion. The Hungarian beteg ‘sick, ill’ (and betegség ‘sickness, illness’) is a very old word and was borrowed from Hungarian into Rumanian, Slovakian, Croatian, and Slovenian in the Middle Ages. Javas or jós ‘healer, person foretelling the future’ is a derivation from jó ‘good’ (which has a Finno-Ugric etymology), and the earliest written document in which it occurs uses it to refer to a ‘collector of goods’. Another word, orvos ‘physician’, can be derived from either the Finno-Ugric or the Turkic languages, in both cases with the original meaning ‘magic, fortune- telling’. A well-known word, táltos ‘a person with supernatural knowledge and power’ occurs in early Hungarian written documents, but without any direct reference to ‘magical healing’. Of course, there are other terms in early Hungarian healing with an early magical or religious background, usually connected with shamanism, which are not dealt with in this paper. In 1926, in the Sakha Republic (Yakutia), then known as the Yakut Autonomous Soviet Socialist Republic, the first painting portraying a shaman during a séance was realized by Ivan Popov. 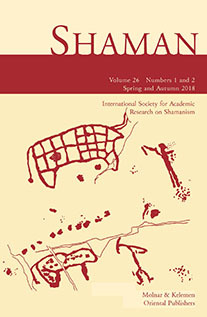 Despite strong repression in Soviet years, the interest in shamanism and shamans from an artistic point of view did not fade, as shown by the production of Sakha artists working in the 1950s through the 1980s such as A. Osipov, V. Vasil’ev, Iu. Votiakov, and S. Parnikov. Several years later, after the fall of the Soviet Union, the Sakha Republic (Yakutia) witnessed an unprecedented flood of cultural and spiritual revival represented by a growing, general self-consciousness brought on by intense efforts at cultural conversion, including new interests in art. A contemporary generation of artists, mostly of Sakha origins, are devoting their production mainly to the issue of shamanism and shamans. Combining different techniques, such as painting, drawing, and weaving, these artists focus on the representation of past and present shamanism and on particular moments in a shaman’s life, such as the tearing apart of the body, the shaman’s flight, and so on. Their works are of great interest for at least two reasons. The first is that they are displayed at the State National Museum of Arts in the capital city, Yakutsk, in the section devoted to the permanent collection. The second is that, in the past decade, they have often been one of the main sources to which intellectuals, historians, and scholars refer to recreate a ‘pure’ and ‘original’ religious system. But where do these artists draw inspiration from? 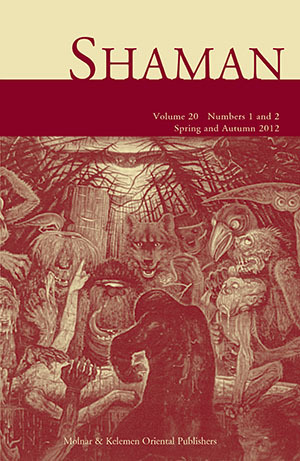 My paper aims to illustrate the implications of shamanism as a form of art. It also explores the relationship between contemporary shamans and contemporary artists.